During his lifetime, Anthony Mary is not known to have worked many miracles. However, the gift of working miracles which he did not have on earth, God granted him to a very high degree after his death. Very numerous are the miracles worked through his intercession. In olden times, clear testimony of this is given by many writers. Giuseppe Bresciani in his Crown of Cremonese Saints, speaking of Zaccaria, says expressly, "that after his death the Lord worked many miracles and favors." 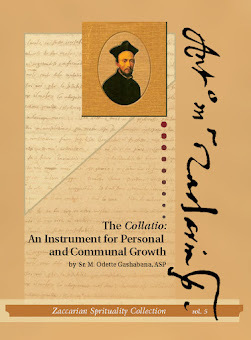 Agostino Barbosa, the celebrated jurist consultant, in his work on Ecclesiastical Rights (1628), writes of Zaccaria, " that as he was holy in life, so he was illustrious after death by the glory of his miracles." And the same is confirmed by other writers such as Angelica Gonzaga. Father Faustino Premoli, rector of the Barnabite College in Crema, on the evening of July 15, 1747, kneeling before a picture of Anthony Mary, prayed fervently that God would condescend to render the Saint illustrious by some new and striking miracle in order that the Barnabites might be enabled to appeal for the process of his beatification. The next day some devout persons were praying as usual before the picture when, behold, they saw it surrounded by a bright light. The Servant of God, letting the lily (which before was upright) fall down on his left arm, raised his right hand from his breast and blessed them as a priest does at the altar. While this happened, Father Premoli, who was facing the people, (for he was giving them the blessing with the relic of the Saint) seeing in them a certain awe and wonder, asked what had happened; but no one dared to speak. The apparition over which they exclaimed, "Oh! What a miracle, what a wonderful miracle we have seen!" Those who were present related what had occurred. A standing proof remained in the picture itself, for neither the left hand of the Saint nor the lily took their former position. This was verified not only by Father Premoli, but also by many persons who remembered how the picture had first been painted; among these was the painter Tommaso Picenardi who had taken some copies of it. In the 19th century, we can say without question that the graces received through the intercession of the Saint can be counted by hundreds. Space, however, will only permit to give the three miracles that served for the canonization of St. Anthony Mary and a few other miraculous incidents that happened in later dates. The first took place at Castagnolo Minore near Bologna in 1876. 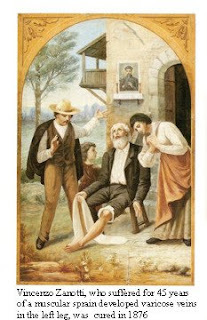 Vincenzo Zanotti, a peasant, 20 years of age, because of a muscular sprain, developed varicose veins in his left leg. Ulcers soon formed and he continued in this state for 45 years. His sufferings became unbearable. Having lost all hope of regaining his health, Vincenzo Zanotti, on the advice of one of his friends, turned to St. Anthony Mary Zaccaria. 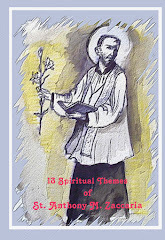 With all the fervor of a soul full of faith, he made a novena and then a triduum to the Saint. He applied the pannolino (a small piece of linen that had touched the bones of the Saint), which he had, to the part affected. God rewarded his faith, for at the end of the triduum he found the leg perfectly cured. He and all present including the doctor cried out, "A miracle!" Vincenzo, being completely restored to health, took up his usual work. Six years later, an investigation was made in Bologna on this truly miraculous cure. He deposed on oath, “I, from that day, have always been perfectly well." Much more striking is the following cure which took place in Cremona on May 21, 1873. Paola Aloni, 42 years of age, was suffering from an incurable organic spinal condition which had kept her bedridden for seven years. Her sufferings increased to such an extent that she got no rest neither night nor day. For four months, she had been unable to take any food except a little broth. On May 15, 1873, the Last Sacraments were administered to her. However, she continued to recommend herself to St. Anthony Mary, to whom she had for six months been making novena after novena, believing all the time that the saint would cure her. "I have never been as ill as I am now, " she said to her confessor, "and this shows the favor is about to be granted. You will see a great miracle.” As a matter of fact, the miracle was not delayed. On the morning of May 21, she felt an irresistible power urging her to rise from her bed. Fearing that she would not be able to stand on account of her great weakness, she asked to be touched with the relic of the Saint. In a moment she regained her strength and without help rose from her bed. Her malady had disappeared. She was perfectly cured! People came and went all day, wanting to witness for themselves the great miracle that had been worked. Francesco Aloni, 52 years of age, a brother of Paola Aloni, had suffered for three years from ulcers and sores in his leg caused by varicose veins. The pus that issued from these sores was frightful, and the sufferings of the poor man daily increased. In the summer of 1876, his state became very serious obliging him to stay in bed. After having been kept in two hospitals for several months, he was dismissed, his case having been pronounced chronic and incurable. The poor man left the hospital crawling rather than walking. Unable to get home, he dragged himself to his sister's house which was near. She, seeing him in such a sad state, said to him, as if inspired from on high, "Francesco, have you never recommended yourself to the Blessed Zaccaria?" To this he never answered but burst into tears. 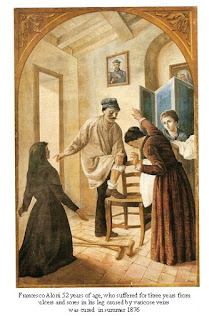 The sister too wept, but full of confidence, she touched his leg with the relic of Anthony Mary, saying, "Through the intercession of Blessed Zaccaria may God restore you!" For a while both remained silent. 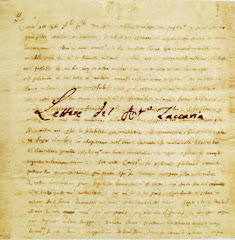 Then Paola added, "Francesco, promise me to make a novena to the Saint." The brother promised and left the house in better spirits. Francesco and Paola prayed fervently for the nine days. On the ninth day, October 23, 1876, the leg was straightened. What a moment that was! The leg was perfectly healed. He ran to his sister's house anxious to relate the miracle. "My Paola, he cried, I am cured. Tomorrow I will return to my work", and so he did. So complete was his cure that from that day he enjoyed perfect health. A young Italian woman, Eliza Greco, was in great trouble, seeing no prospect of the obstacles to her marriage being removed. She was engaged to an officer who, on account of his financial circumstances and his health, found it utterly impossible to carry out his wishes. To make matters worse, there was no prospect of his being ordered to the African Colonies. He wanted to retire from the army, but this did not lessen the difficulties. There were also drawbacks, to his getting other appointments. Those to whom he applied seemed to think it strange that he should wish to change his profession. Meanwhile, the lady to whom he was engaged, being in the habit of attending parish church of the Barnabites, heard in a sermon of the many and wonderful favors obtained through the intercession of St. Anthony Mary. She made some special promises to the Saint and began a novena in his honor. Her faith was very soon rewarded for, contrary to all expectations, the officer obtained a splendid appointment that put an end to all their difficulties. On May 3, 1899, they hung a silver heart that might serve as a lasting token of their loving gratitude to their heavenly near the tomb St. Anthony Mary Benefactor. A young girl named Adalgisa Comelli, working as director in the Istituto Girelli at Marone, on the Lago d'Iseo, was attacked by a disease beginning with a sore behind her right ear. This remained a deep and open wound till at last the bone became infected. Every remedy was tried and several specialists were consulted, but nothing could be done. Year after year, things grew worse. Towards the end of October 1898, it was decided that an operation must be performed and a part of the skull removed. The poor girl worn out from pain, and frightened at the thought of the terrible operation, asked to have it postponed for nine days. On the advice of the Directress of the Institute, she turned with all her heart to St. Anthony Mary. Using no further remedies, but consecrating these nine days to the Saint, she begged his help recommending all of herself to him. She also received from the Directress a relic of the Saint to put under her pillow. What a joy to find, on the morning of the ninth day, that she had not only slept all night and no longer felt any pain, but that she was perfectly cured. The wound was healed, and there was no longer any trace or mark of the disease that had caused her such frightful sufferings for eight years. She at once had a Mass said in thanksgiving to St Anthony Mary. Gustavo Mortara of Canneto sull'Oglio had, for fourteen months, been suffering from complications of diseases. His whole body was one immense sore, and a gangrene had already set in. The doctors had given up, and he awaited death. He could not hope in God because he hardly knew God existed. His wife, who was a devout Catholic, used every means in her power to get him to go with her to visit the altar of St. Anthony Mary. She used every persuasion, and with the help of others, at last induced him to go with her to the church. Entering, he asked what altar might that be where he saw so many votive offerings. She told him it was the altar of St. Anthony Mary Zaccaria who worked such wonderful miracles and cured so many who invoked his intercession. "Oh" he said with a sneer, "you mean to say I suppose that I, too, shall be cured." His wife, always sweet and gentle to him, explained that to be cured, one must pray. After great persuasion, she made him promise to join her in saying an Our Father, a Hail, Mary, and a Glory Be for nine days in honor of St Anthony Mary. She stayed by his bedside, night and day which required more than human strength and courage; for the exhalations from the sores which covered his body made it almost impossible to approach him. She prayed without ceasing and got others to pray for him. The sick man kept his word faithfully and read (for he did not know a prayer) the Our Father, Hail, Mary and the Glory Be every day. On the morning of the fifth day of the novena to the Saint, after having slept all night, he awoke and cried out joyfully to his wife, "Teresa, I am cured! I am perfectly well! That saint has cured me, it is certainly he who has done it." It was true. The sores were all perfectly healed. His skin, that had been the color of bronze, had assumed its natural color. His appetite had returned. In short, he was in perfect health. On May 11, 1899, he came with his wife and daughter to the church to thank St. Anthony Mary for the wonderful miracle. He had a Mass of thanksgiving celebrated at his altar, promising to make a votive offering at his shrine and to recite in honor of his heavenly Benefactor an Our Father, Hail, Mary and a Glory Be every day for as long as he lived. Antonio Marazzi, a father of a family of eight, the eldest of whom was not 21 years of age, fell from a hayloft. His head, having hit a sharp stone was terribly cut. He was immediately brought to the hospital where it was found that the wound was more than 3.5 inches deep. Almost immediately, tetanus, or what is more commonly known as “lock-jaw”, set in. After a careful examination, several doctors pronounced his case hopeless. One of his daughters and his sister-in-law (both of whom were hospital nurses), seeing that there was no longer any hope, turned to St. Anthony Mary. 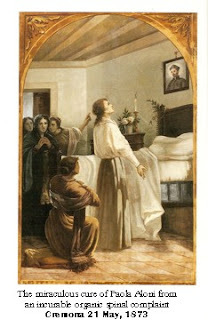 They put a pannolino on the sick man, had a Mass celebrated at the tomb of the Saint, and began a novena in his honor. This great Saint, so sweet and loving in life, and now ever ready to sympathize with those who in their sorrow turn to him with love and confidence, crowned their faith by working a wonderful miracle in Marazzi’s favor. The man was restored to perfect health. The cure was so complete that, as was testified by his sister-in-law on September 2, 1899, he was able to take up his usual employments just as though he had never been ill. These facts are not only attested by eyewitnesses but also are recorded in the hospital register where, not only this case, but also the circumstances connected with the cure, are minutely described.